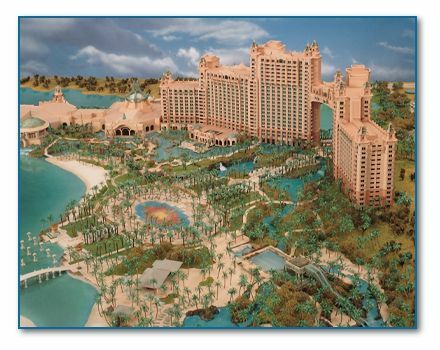 Located on Paradise Island, adjacent to Nassau in the Bahamas. Largest Casino in the Caribbean Over 800 Slot Machines Baccarat, Blackjack, Roulette, Craps, Caribbean Stud Poker and a Salon Priv�. The Marketplace - Buffet - The anchor of the dining experience at the Royal Towers, this facility serves exquisitely prepared dishes from around the world in a lavish international marketplace buffet setting with various cooking islands. Culinary offerings range from fresh seafood and Caribbean specialties to made-to-order pastas and irresistible desserts. Open for breakfast, lunch, and dinner with indoor and outdoor seating. Resort casual attire for breakfast. Resort upscale attire for dinner. Seagrapes - Buffet - An all-day buffet with tropical foods from around the world, including Cuban, Cajun and Caribbean-style cuisine, Bahamian specialties, pasta and stir-fry creations, brick-oven pizza, carved meats and a selection of delectable desserts. Resort casual attire for breakfast and lunch. Resort upscale attire for dinner. Water's Edge - Buffet - Family-style international restaurant, featuring a buffet breakfast each morning and Italian cuisine each evening. Guests dine overlooking the Water's Edge Lagoon. Resort casual attire for breakfast. Resort upscale attire for dinner. The Cafe at the Great Hall of Waters - Gourmet - Located at the base of the grand staircase in the hotel's breathtaking Great Hall of Waters lobby, this restaurant/lounge provides panoramic views of "The Ruins of Atlantis" and the marine life that call it home. Open for all-day dining. Resort upscale attire. Dune - Gourmet - Set atop a white sand bluff affording dramatic ocean views, Dune is an acclaimed restaurant by chef Jean-Georges Vongerichten. Dune offers guests an unexpected menu of French-Asian cuisine infused with Bahamian influences. For lunch, enjoy refreshing salads and light plates on the patio overlooking the beach. Dinner selections include the freshest local seafood, duck, veal chop and chicken seasoned with herbs grown in Dune's organic garden. Located at nearby One&Only Ocean Club. Resort upscale attire for lunch. Resort elegant attire for dinner. Fathoms - Gourmet - Perhaps the most dramatic of all dining establishments at the resort, this exciting facility peers into the mysterious depths of "The Ruins of Atlantis" with its live marine inhabitants. Showcasing the freshest of seafood from the Caribbean and Atlantic, this restaurant is open for dinner and features New Age and World music. Resort upscale attire. Bahamian Club - Gourmet - Begin a superb dining experience with gourmet salads, followed by the finest cuts of succulent steaks like Chateaubriand for two, or chicken and fresh grilled seafood. The Bahamian Club's warm and inviting atmosphere is the perfect setting for traditional fine dining. Located in the Coral Towers. Resort elegant attire. Nobu - Gourmet - Experience the new trend in Japanese cuisine at the newest outpost of the acclaimed Nobu restaurant by celebrated Japanese Chef Nobu Matsuhisa. They will savor favorites including new style sashimi and yellowtail with jalapeno, or indulge in the multi course chef 's choice, Omasake. Nobu welcomes guests 6 years of age and older. Resort elegant attire. Cafe Martinique - Gourmet - Famed chef Jean-Georges Vongerichten brings his culinary expertise to the re-invention of the historic Cafe Martinique. A Steinway piano welcomes diners to this graceful candlelit restaurant featuring French gourmet fare and spectacular marina views. The glass-enclosed cellar carries an international variety of acclaimed wines from French to Californian boutique wineries. Cafe Martinique welcomes guests 6 years of age and older. Casa D'Angelo - Gourmet - Tuscany meets the Caribbean as Chef Angelo Elia brings his award-winning South Florida italian eatery to the Bahamas. En extensive menu of traditional Tuscan fare, laced with southern italian accents, is offered in an intimate setting. Enjoy one of Chef Angelo's signature dishes, paired with wine from their extensive wine list, and finished off with an espresso-soaked tiramisu for a superb dining experience you'll long remember. Carmine's - Gourmet - Enjoy the lively atmosphere and family-style dining experience of this famous New York landmark. Sumptuous platters of classic Italian recipes such as chicken scarpariello, shrimp scampi, fried calamari and veal saltimbocca are served in abundant portions to family and friends. They can also select from an array of fine Italian wines, including a private label magnum. Located at Marina Village. Resort casual attire. Mama Loo's - Gourmet - Serving dinner nightly and featuring Chinese (and occasionally Bahamian) delights. A vibrant restaurant with warm, friendly service. Seafire Steakhouse - Gourmet - Dine in a modern steakhouse ambiance where rich, smoked, seared and grilled flavors of succulent fare await their discovery. Tempting starters from classic shrimp cocktail to coriander crusted beef carpaccio complement entrees such as lemon-pepper tuna, sweet Bahamian lobster tails and the finest cuts of prime beef. The menu introduces a variety of signature martinis and offers an extensive collection of fine wines. Located at Marina Village. Resort upscale attire. Atlas Grill & Bar - Casual - A lively video bar and family restaurant beside the casino and overlooking the resort's new marina. Open for lunch and dinner and serving huge portions of American favorites, including over-stuffed sandwiches, burgers and more. Resort casual attire. Murray's Delicatessen - Casual - This New York-style restaurant and deli features pastel booths, reflecting a 1950's Miami decor, and serving traditional deli food. Resort casual attire. Also features deli favorites "to go". Bimini Road - Casual - Savor the islands by discovering Caribbean fare in this fun, casual and colorful restaurant with ocean-inspired interiors and an outdoor bar. The grand open kitchen features a conch station where fresh, Bahamian conch is prepared to order. Uniquely spiced entrees such as tamarind-glazed pork chop, grilled mahi mahi and mojo-marinated chicken are tamed by sweet �tings' like pineapple bread pudding, tropical sorbets and cookie-bash pie. Located at Marina Village. Resort casual attire. The Point Restaurant - Casual - Located just steps away from the pool at Atlantis Harborside Resort, The Point Restaurant and Bar offer light meals and cocktails from 8am to 10pm daily. This spectacular waterfront locale offers sweeping views of Nassau Harbor, providing a unique backdrop to enjoy a relaxing meal or happy hour. Resort casual attire. Johnny Rockets - Casual - Family-friendly Johnny Rockets is a fun 1950's style diner where tabletop jukeboxes belt out tunes for a nickel. Guests will enjoy great tasting, all-American favorites including juicy hamburgers and chili dogs, chicken salads, hand-dipped shakes and malts and freshly baked apple pie. Located at Marina Village. Resort casual attire. Voyagers - Perfect for delicious breakfasts while watching the sunrise over the ocean. With a decidedly nautical theme, Voyagers is open all day for snacks, including New York-style bagels, pastries, cakes and chocolates as well as gourmet coffees. Dive In - Poolside American fast-food restaurant serving grilled burgers and chicken as well as salads, sandwiches, and soft drinks. Shark Bites - A Bahamian deep-sea-fishing-themed fast-food restaurant and bar located at the base of the Mayan Temple. Serving Bahamian and Caribbean specialties and featuring live Bahamian entertainment daily; open for lunch only. Casual attire. Shark Bites Express - Takeout area of Shark Bites. Lagoon Bar & Grill - Guests can access the Lagoon Bar through an underwater glass tunnel running directly beneath the Predator Lagoon and Reef. Deli sandwiches and salads are menu favorites served for lunch, with drinks available throughout the day and early evening. Also serving dinner April through August. The Cave Grill - Authentic re-creation of an actual Bahamian sea cave where burgers, hot dogs and other snacks are served throughout the day. Village Creamery - An authentic ice cream parlor serving up cool, refreshing treats for kids of all ages. Overlook Cafe - A relaxing area for cocktails over- looking the River Pool. Marina Pizzaria - Watch the Bahamian sun go down while enjoying, sandwiches, salads, and oven-baked pizza plus a wide selection of beers and frozen cocktails, all on an outdoor terrace overlooking the majestic yachts in the Marina. Or pick up a fresh homemade pizza to go! Dragons - Lounge and dance club, with its video wall, features live entertainment. Plato's Lounge - Offers panoramic views of the resort. The Baccarat Lounge - A sophisticated vantage point from which high-limit guests are able to keep their eyes on casino action.